Following the appetising starter and another round of complimentary champagne, the staff delivered our main course. 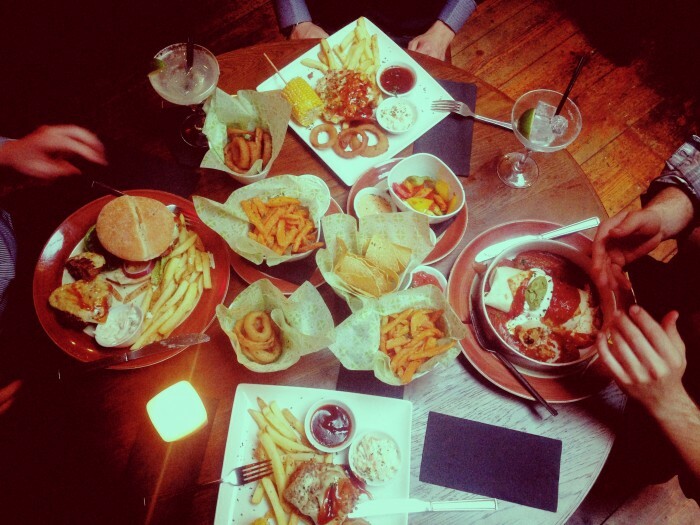 In order to get a fair representation of Chiquito’s main offerings, we ordered a wide variety of courses; consisting of one ‘BBQ Double Cheese’ burger, one ‘BBQ Texan Chicken Melt’ Tex Mex, one ‘Southern Fried Chicken & BBQ Pulled Pork’ Tex Mex and one ‘Fully Loaded Burrito’. These were complimented with side orders of ‘Tortilla Chips & Salsa’, ‘Sweet Potato Fries’, ‘Onion Rings’ and ‘Roasted Veg’. Despite our high expectations gained from previous visits to Chiquito’s, the main course further raised our high quality perception of the brand, with all members of the Social Student team satisfied! The ‘BBQ Texan Chicken Melt’ Tex Mex centred around the perfectly tender grilled chicken breast (covered in Chiquito’s tasty Texan cheese sauce), served with a satisfying, yet not overwhelming, portion of chips, onion rings and corn on the cob. The ‘Southern Fried Chicken & BBQ Pulled Pork’ Tex Mex was equally full of flavour, with the only criticism being a feeling that there was too much cheese, which may have been better substituted with a bigger serving of pulled pork (but this is probably a matter of personal taste!). The ‘BBQ Double Cheese’ burger was perfectly summarised with this quote from one of our writers; “As a man who knows his meat, this was definitely the best burger I have ever had. Hands down!”. Finally, the spicy chicken ‘Fully Loaded Burrito’ went down a treat and was greatly complimented with Chiquito’s signature tomato sauce. In summary of the main course, we were impressed with the quality of food and portion sizes, which allowed room to sample the variety of side orders. We particularly recommend the ‘Sweet Potato Fries’, which made a pleasant alternative to typical restaurant fries, and were crispy, not greasy. I will certainly be ordering these again in the future!